The Land Trust Accreditation Commission, a national independent program of the Land Trust Alliance, announced on July 31, that San Isabel Land Protection Trust has been awarded accredited status. 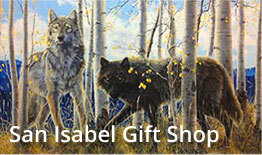 San Isabel Land Protection Trust was founded in 1995 and works in Custer, Fremont, Huerfano and Pueblo Counties. The land trust has recorded over 100 conservation easements to protect over 32,000 acres of working ranch, farm and forest land and wildlife habitat in the region. Land is America’s most important and valuable resource. Conserving land helps ensure clean air and drinking water, food security, scenic landscapes and views, recreational places, and habitat for the diversity of life on earth. Across the country, local citizens and communities have come together to form land trusts to save the places they love. Community leaders in land trusts throughout the country have worked with willing landowners to save over 37 million acres of farms, forests, parks and places people care about. Strong, well-managed land trusts provide local communities with effective champions and caretakers of their critical land resources, and safeguard the land through the generations. San Isabel Land Protection Trust joins 59 land trusts who have been awarded accreditation since the fall of 2008 and is among only 6 land trusts in Colorado who have achieved this status. Accredited land trusts are able to display a seal indicating to the public that they meet national standards for excellence, uphold the public trust and ensure that conservation efforts are permanent. The seal is a mark of distinction in land conservation. The Land Trust Accreditation Commission, based in Saratoga Springs, N.Y., awards the accreditation seal to community institutions that meet national quality standards for protecting important natural places and working lands forever. The Commission, an independent program of the Land Trust Alliance established in 2006, is governed by a volunteer board of diverse land conservation and nonprofit management experts from around the country. The Alliance, of which San Isabel Land Protection Trust is a member, is a national conservation group based in Washington, D.C. that works to save the places people love by strengthening conservation throughout America. More information on the accreditation program is available on the Commission’s website, www.landtrustaccreditation.org. More information on the Alliance is available at www.landtrustalliance.org.